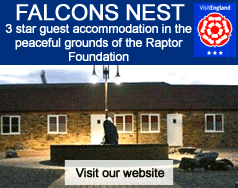 Your party at The Raptor Foundation will be an enjoyable, educational and memorable experience for which we recommend that you allow a minimum of 2 and a half hours. 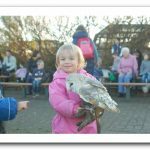 The cost per person is £9.95 This cost includes admission, a choice of party options which are, Reptiles and Mini Beasts, Fur and Feather or Birds of Prey (which includes a flying display). A hot or cold menu is also included. Parents of the birthday child get free admission. 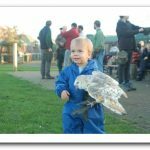 REPTILE & MINI BEAST PARTY – This will involve the party going to the reptile house and having hands on experiences with snails, millipedes and cockroaches. As well a chance to get up close to a bearded dragon, snakes and tortoises. The party can then either have a group photo or just the birthday child with a mini beast. They will then go to the party room for the usual menu. 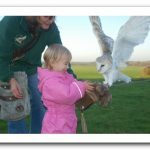 FUR & FEATHER PARTY – This will involve the party having a guided tour of the centre, a hands on experience with some of the birds for all the party. They will then go to the reptile house for 11.45am where they will be told about the Meerkats and the birthday child can go in the feed them. Must be over 8 years old. The party can then have either a group photo or just the birthday child with a bird. They will then go to the party room for the usual menu. 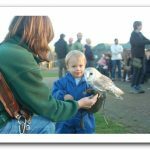 BIRD OF PREY PARTY – This will involve the party having a guided tour of the centre, a hands on experience with some of the birds for all the party. They will all then get a chance to fly at least two birds that are of appropriate size for the group. The party will then either have a group photo or just the birthday child with a bird. They will then go to the party room for the usual menu. CRAFT ACTIVITY PARTY – This will involve the party having one hour to do craft activities and then watch a flying display. Your party, of up to 15 children, will be held in the Silent Wings Party Room, which we will decorate with balloons and a banner. Morning parties food is served after your experience, afternoon parties food is served before your experience. To book a party either phone the Centre on 01487 741140 or enquire in our Tea room or Gift Shop. A minimum non refundable deposit of £10 is required when you book your party. We can also include craft activities for £2.95 per head. Party bags are also available at an additional cost of £2.25 per bag. As the food is freshly prepared, we ask that party bookings are made at least 10 days in advance. A non refundable deposit will be required at the time of booking. A choice or hot or cold menus are available. Please contact us to book your party & select your menu. All menus include Soft Drinks & Ice Cream/Fruit.